Went to Small Bar last night for dinner. Upon sitting down at the bar I was given two menus: food menu and beer menu. I thought it was pretty cool. The beer menu had descriptions for each beer (with some humor in the commentary), which was really cool to be able to read through before selecting beers. The food menu was pretty good, with sandwiches, salads, burgers and pizza. I had the BBQ Pork sandwich, which I had to eat half with a fork because I couldn't find the bottom of the bun! So you won't leave hungry. 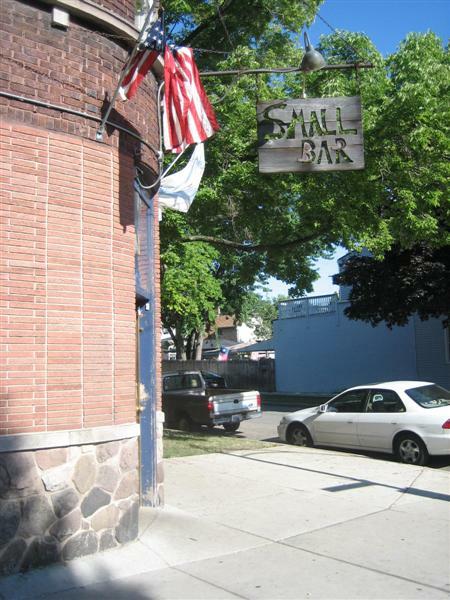 The bar is small (duh), but set in a neighborhood which, for a neighborhood bar, is super high quality. I'll definitely go back. More rotating taps, cool bartender on a weekend afternoon. Can't beat the homey feel of this place. Chalkboard beer list doesn't get updated much, they have been out of a couple for months now...ask the tender/server for what's on their 4 rotating taps. This is a nice little oasis tucked into the Logan Square neighborhood. Everyone else has described it well, I would add that Sundays are "movie night". Cozy, dim lighting cast from orange lamps, dark wood bar with a rail, room paneled midway to the floor with similar dark wood. Nicely detailed wood columns behind the bar. Sunday crowd was small, a few leftover football fans, and neighborhood folks. Certainly less trendy than the Division street location. Wish they got the exclusive taps here instead. Taps are 2/3 standbys and 1/3 rotating. Two Bros. Heavy Handed was on special for $4 when I went (marked on the chalkboard on the front door). Usually two seasonals, Spaten Oktoberfest and another fall seasonal were on. Rotating Rogue tap as well, described as a dry-hopped red ale. Several Hitachino bottles, Orval, Two Bros., Three Floyds. Food was good, had a double BLT sandwich with tater tots and sweet potato fries that were nice and crispy. Specialty pizzas and appetizers were also available. Some were a cut above standard bar fare, such as baked goat cheese & tomato sauce. Fried cheese curds came with a spicy mustard. Three tv's were a little distracting in such a small space, but it was fun when they put on a Jarmusch movie. This is one of those bars that I miss after a few weeks. The staff, bar, beer, atmosphere, and food are great. In the summer the patio is refreshing, and in the winter, it's the perfect cozy bar. Definitely one of my favorite corner bars in Chicago. Always a great, changing, seasonal tap list. Staff is very knowledgeable about the current offerings. Food is very fresh. Had a salad in the summer which had green beans from one of the serverâ€™s garden. Try the cheese curds - the honey sauce is delicious. Burgers and salads are also good, and have heard great things about the fish sandwich. All-around the perfect neighborhood joint. 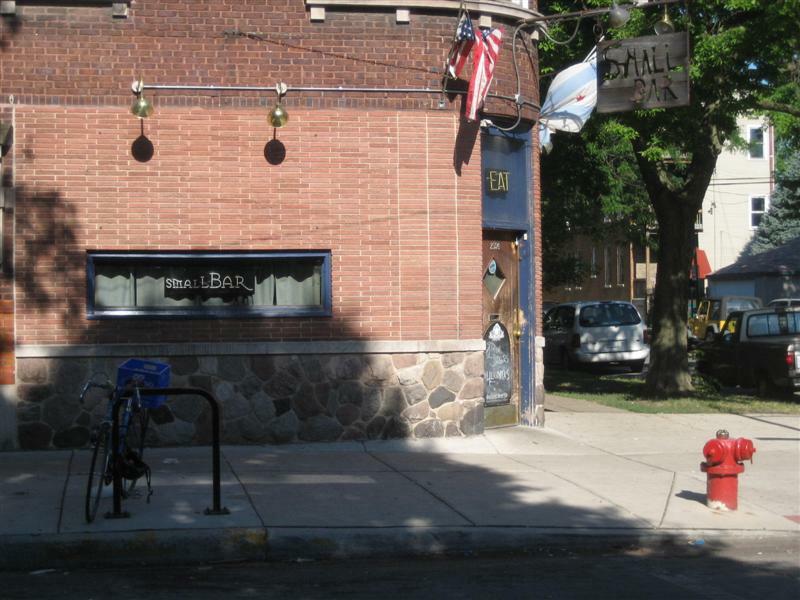 The Small Bar (this location is their original location) is located north of Logan square and it is 4 or 5 blocks from the Logan Square stop on the blue line. The atmosphere is nice. It was a bit smoky, but that's to be expected in a Chicago bar. From the outside Small Bar doesn't appear to be a bar. It's in a cute little neighborhood, and if you walk here, you may wonder if you're in the right place. There are 15 taps, half of which seem to be focusing on regional beers. There is a large chalkboard broadcasting the bottled selections, of which most were imports or Micros. I think there were 50 or 60 bottled beers available. We had great service at the bar. The quality of Small Bar's beers are good. I spoke with one of the owners, and he seemed to know his beer and felt that beer was very important to his establishment. The food was good. I had a chicken club sandwich and my wife tried their turkey burger. I will definately be back here, since it's close to my house. The front door and sign.